Have you heard of the Azores? Sounds pretty exotic right? The Azores is a cluster of nine beautiful islands located in the Atlantic Ocean. Somehow the Azores aren’t very well-known and remain off the tourist radar. I have to admit I also didn’t know a single thing about the Azores before booking a last-minute ticket to Sao Miguel, the biggest islands in the archipelago. However, the pictures on Google looked stunning so I didn’t think have to think twice about taking a trip there. It was a smart decision, Sao Miguel turned out to be one of the most beautiful islands I have ever seen! Temperatures on the Azores range between 12 (winter) and 25 (summer) degrees Celsius. The best time to travel to the Azores is between April and October because these are the driest months. On my trip to the Azores I visited the island Sao Miguel. Sao Miguel is the biggest island of the Azores and easily accessible from the European mainland. Because I only had a couple of days to explore the Sao Miguel (I left Friday afternoon and came back Tuesday morning 5am…) I crammed as much sightseeing into these days as possible. On the three maps below you can find all the places I visited, there are so many things to see and do on Sao Miguel! To explore as much of Sao Miguel in three days as possible, I rented a scooter for the first two days of my trip. 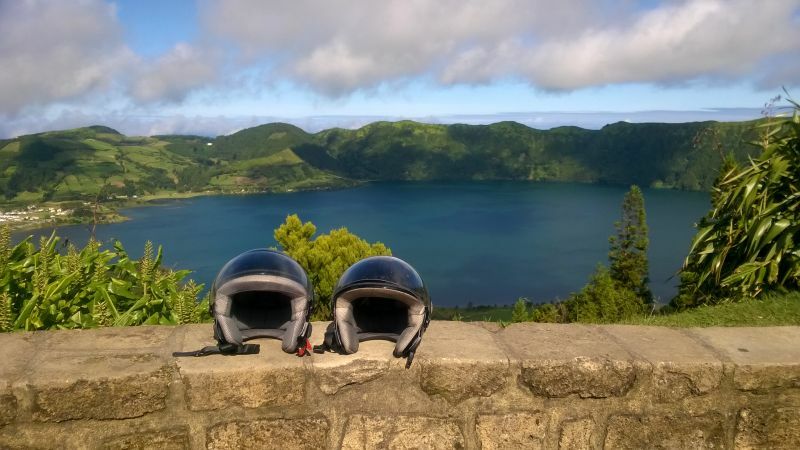 On day 3 I exchanged the scooter for a tiny Smart, because the attractions I wanted to visit were a bit further away from Ponta Delgada where I had based myself. During the first day of my Sao Miguel trip I explored the South of the island (on a scooter) and hiked to Lagoa do Fogo. Ponta Delgada: Ponta Delgada is the capital of the Azores and the perfect place to base yourself on your Sao Miguel trip. The city center can easily be navigated on foot and there are lots of restaurants, cafes and bars to grab a bite or a drink. R 1-1 road: a wonderful coast road from Ponta Delgada to Agua de Alto. Along the way you’ll pass sleepy little villages and beautiful bays. Caloura Bay: a cute and tiny harbor with gorgeous views. Look at those fisherman, I don’t think much has changed here in the last decades… What a beautiful place to live! 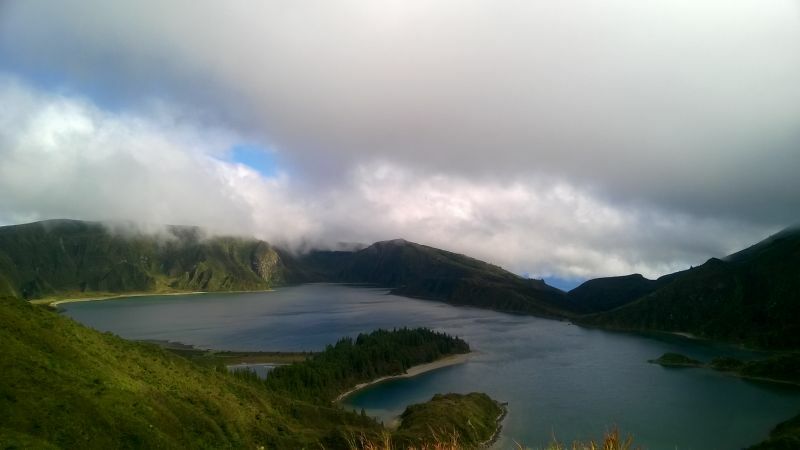 Hike to Lagoa do Fogo: a 4-5 hour hike. It’s a steep climb from Bahia Palace hotel, but definitely worth the effort. 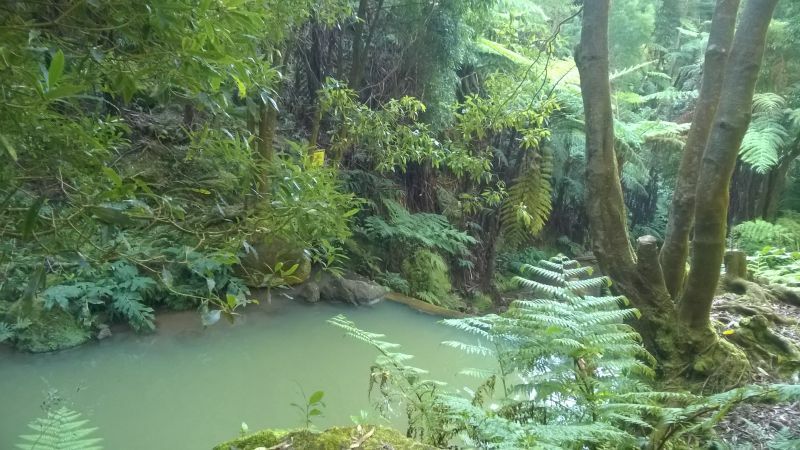 About halfway into the hike you find a levada, a water channel with clear and fresh water. The trail runs parallel to the levada for most part of the hike. I loved this hiking trail, the landscape is really varied and offers beautiful coast views! During the second day of my Sao Miguel trip I explored the West of the island (on a scooter) and made a big loop via Ribeira Grande. Sete Cidades: this area is probably the most famous and most visited place of the Azores. But that pretty understandable, I mean, look at this view over Lagoa Verde and Lagoa Azul… There is a tragic legend explaining the difference on color the two lakes, you can read it here. There are several hiking trails in this area, more information about these can be found here. R 1-1 road: it’s an absolute delight to drive from Sete Cidades to Ribeira Grande. The views over the oceans are stunning and you’ll pass through lovely villages like Ajuda da Bretanha and Remédios. 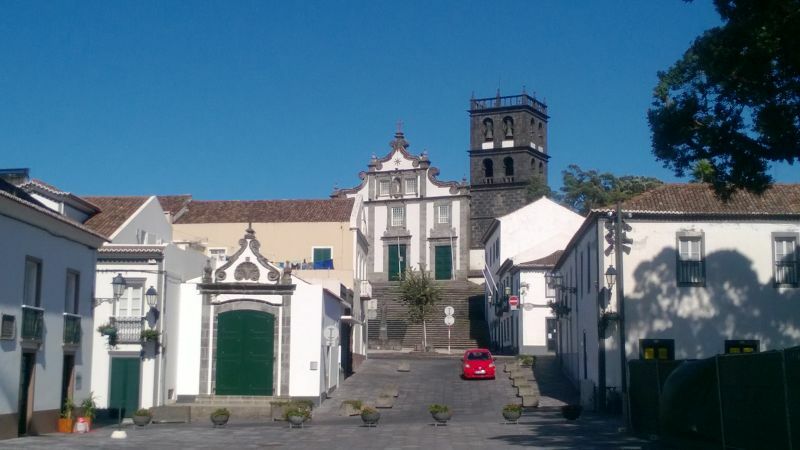 Ribeira Grande: a lovely town with beautiful historic buildings and one of the oldest churches of the Azores. Definitely allow yourself some time to stroll around this village! It’s also a nice place to stop for lunch or a drink. Caldeira Velha: a natural hot spring in the middle of the forest where you can soak and relax! There are showers and dressing rooms. The entrance fee is €2 per person. View over Lagoa do Fogo: if you continue driving road R 5-2 you’ll ascend to a 950 meter high pass where you’ll have an amazing view over Lagoa do Fogo. There are lots of twists and bends in this road, but it sure is beautiful… From the pass the road goes back down to sea level, where you can make your way back to Ponta Delgada via R1-1. During the third day of my Sao Miguel trip I explored the East of the island (by car) and visited a tea factory. 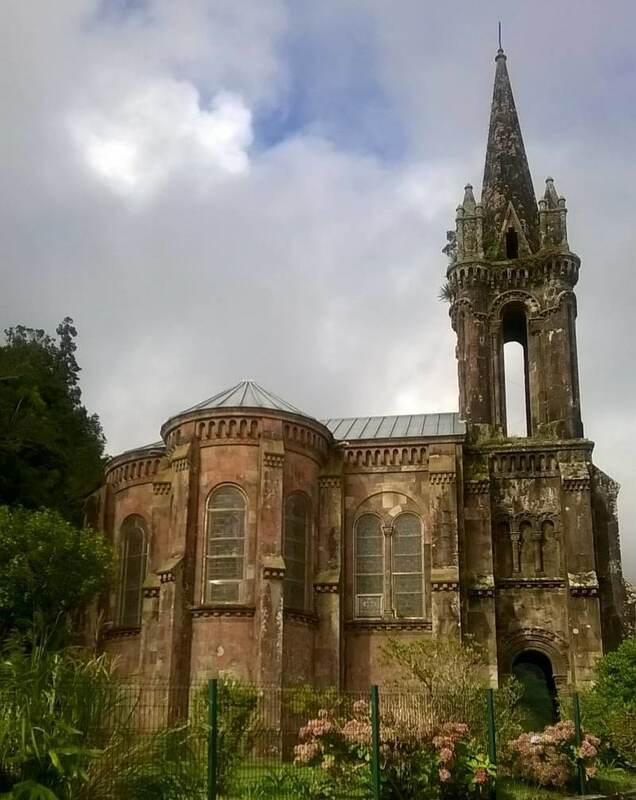 Lagoa das Furnas: at the south side of Lagoa das Furnas you’ll find an abandoned church slowly crumbling to pieces. It’s a nice place to stretch your legs and of course the church is very Instagramable;-). Sample the local delicacy in Furnas: when on Sao Miguel, more specifically when in Furnas, you have to eat a warm bolo levedo. A bolo levado is a sweet flat bread, typically eaten with butter or homemade jam, jummie! Calderas: in Furnas village you can explore an area of thermal activity. Be careful when walking around the calderas and steaming vents! Also, the pungent sulfur smell takes some getting used too;-). Chá Gorreana: the only remaining tea factory on the Azores. Well, actually in Europe because the Azores are the only place in Europe where tea is grown. This factory has been in use since 1883, I highly recommend a visit! You can also sample the tea and buy some tea souvenirs. I booked a travel package with Tui, the price for 2 people was €500 (€250 per person) and included a return flight from the Netherlands to Ponta Delgada, transport from and to the airport of Sao Miguel and our accommodation in Ponta Delgada. I spent 3 nights/4 days on the island. I always use Skyscanner to find the best ticket prices. Update June 2018: unfortunately the airport shuttle bus which used to run between the airport and the city is no longer available. You can rent a car at the airport or take a taxi into town. I don’t know the exact fee but it’s about 4km to the city center so I estimate it would be around €10. The Talisman hotel was really nice, we had a large room (actually two rooms, a living room and a bedroom with two separate beds), a spacious bathroom with a bath, air conditioning and a safe. The breakfast buffet was great, lots of food to choose from like regional fruit, thee and cheese. The staff was very friendly and accommodating, all together we had a very comfortable stay. Public transportation on Sao Miguel is very limited, therefore I recommend to get your own set of wheels. To explore the island, I rented a scooter for two days (€50 in total) and a Smart for one day (€40), both at Auto Ramalhense. Petrol for the scooter was €5, petrol for the Smart was €15; total transportation costs were €105. There are plenty of rental companies on Sao Miguel, but I was very happy with the service of Auto Ramalhense. They brought the scooter to our hotel and returned two days later to pick up the scooter and drop of the Smart. They also came by to pick up the car at the end of the day. Altogether the rental process was very easy! I had a great holiday on Sao Miguel, it was short but definitely a great introduction to the amazing Azores. You can download the budget breakdown infographic and the 3-day itinerary below. If you have any questions about traveling to Sao Miguel, leave a comment below or contact me! Beautiful pictures! And such an extensive itinerary! 🙂 Thanks for sharing this! I love your selection for Sao Miguel! And the pictures are great! Thank you Paulina:-) Your list is great, it seems I have to go back in May/June to watch the whales! Hi Lotte! I was wondering if the Smart Car you rented was automatic or manual? I am not sure but if I remember correctly it was a manual car. Have a great trip! This brought so many memories back. Glad you enjoyed my home island!! Wow, so cool you are from the Azores! It must have been a great place to grow up. I had such a great (and much to short) time on Sao Miguel and would love to return one day:-). Thanks Sliva, good to know there are camping options on Sao Miguel as well! My husband and I are planning to come to Sap Miguel tomorrow through Wednesday. Unfortunately the forecast calls for rain. Any suggestions as to what to do on the island in inclement weather! Hi Andrea, hmm I don’t have many suggestions as we were very lucky with the weather. But visiting the tea factory is one suitable indoor activity. Walking around in Ponta Delgada could also still be nice as long as you pop into a warm and dry cafe regularly (and it isn’t raining superhard;-). I hope you’ll enjoy your trip despite the rain! Jeepers!! I found a great last minute deal for the Azores too and DIDN’T ACT ON IT because I’m an idiot. Now really wishing I had, it looks amazing! What time period did you go? We are considering this June but I was worried the island wouldn’t be warm enough so I’ve been dragging my feet on purchasing plane tickets. It’ll be the first int’l trip for our 1 year old!, so I wanted it to be a memorable and enjoyable one for her (and us) since it will be a long long long flight from Alaska. Thanks for the information! Wow that sounds like a wonderful first trip for your 1 year old:-). According to Google June is one of the driest months and the average temperature is around 18 degrees Celsius. I visited the Azores at the end of September and experienced similar temperatures. I highly recommend the Azores, I’m sure it will be a memorable trip, but I can imagine the long flight isn’t the best part about the journey. My husband and I are expecting our first child in July, so we’ll also have to learn to fly with a baby;-). Enjoy your trip! I’m so sorry but I haven’t received an email:-( Could you perhaps resend it? My sincere apologies for the inconvenience, I’d love to help you out with your trip to the Azores! I’m so sorry but I don’t see it in my spam folder either. If you could email me at lotte at phenomenalglobe dot com I’ll reply to your email asap! Thank you so much and please do not apologise. I have emailed you and will await for your response. Thanks. Thank you:-) Will wait for your email! Hi I have emailed you, many thanks.